Last week James and I were looking forward to a short excursion on Saturday. We had planned to visit Old Cahaba, the first capital of the state of Alabama. The weather forecast suggested a rainy day so we decided instead to spend a few hours in nearby Wetumpka, AL, just a few miles from our home. Saturday morning we set off to visit a few familiar places and to eat a late lunch at Coaches Corner looking over the Coosa River and the iconic Bibb Graves Bridge. As we finished up lunch we debated whether to wait out the coming rain or try to get home ahead of the strong storm that was on its way. At approximately 2:35 pm we started home. As we pulled down the garage door behind us the tornado sirens sounded. Just before 3:00 pm a tornado hit Wetumpka within sight of the restaurant where we had lunched. We were stunned to see pictures of the impassable road filled with debris where we had driven only moments before. We were very grateful no one was seriously injured and that only our hearts were left in Wetumpka. The following is a description of an old and beautiful church whose building was torn from this earth but whose soul shines bright. The town of Wetumpka was founded in 1834. Two years later the city of 1,200 people founded the First Presbyterian Church of Wetumpka. 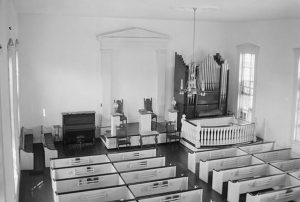 It would take the congregation twenty years to gather funds to build a structure, but by 1856 the group had saved $2,300 and a building committee was formed. Because funds for an architect were lacking, a local builder named Alley is believed to have designed the church. On the preference of the committee, the exterior of the church was primarily Gothic Revival style, while the interior blended Greek Revival with Gothic influences. The one-story board and batten rectangle block building sat on a brick foundation. The tall central steeple would become an icon of the Wetumpka skyline. The church was dedicated on Jun 14, 1857. In 1920 church members purchased the lot on the east side of the building giving children a place to play. In 1948 wings were added on to each side of the original church, but care was taken to preserve the original architecture. In October 1976, 120 years after construction, the church building was listed on the National Register of Historic Places. 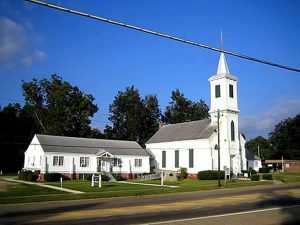 The National Register nomination noted the church’s close connection to many of the prominent events of the town. Numerous civic, political and patriotic gatherings had occurred there throughout much of the 19th century. Members of the church have included notable citizens Mac Freeman (Mayor of Wetumpka), Benjamin Fitzpatrick (11th Governor of Alabama) and Capt. John H. Bankhead (Alabama Senator and grandfather of actress Tallulah Bankhead). 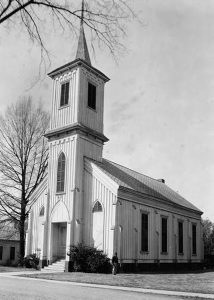 In 1935 pictures were taken of the church for the Historic American Buildings Survey (including two seen here) that are available at the Library of Congress. In his notes the photographer stated that the ladies of the church had been working to restore the building to its original beauty in preparation for the upcoming centennial celebration of the church founding. In doing so they had undertook to restore the interior of their building by preserving “all of the old architectural features and lighting fixtures that had been placed there by their fathers back in the late fifties” – that is the 1850s! Specifically noted were the lights. Mr. A.G. Campbell had purchased ornate chandeliers in New York and donated them to the church. The lights were affixed on hemp rope that could be lowered to fill the bowls with whale oil. By the mid-1930s the chandeliers were converted to electricity and the photographer noted that they would light his descendants for another generation. On January 19, 2019 the lights went out for the last time. A December 1957 article about the centennial of the building called it a “Mighty Fortress.” The Fortress has fallen but the heart of the First Presbyterian Church of Wetumpka beats still. W. Warner Floyd and Ellen Mertins. First Presbyterian Church of Wetumpka National Register Nomination. National Parks Service: Washington, DC, 1976. Historic American Buildings Survey, Creator. 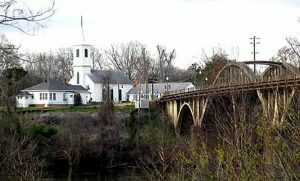 Wetumpka Presbyterian Church, West Bridge & North Bridge Streets, Wetumpka, Elmore County, AL. Alabama Elmore County Wetumpka, 1933. Documentation Compiled After. Photograph. https://www.loc.gov/item/al0169/. Website Design & Development by Moore Tech Solutions, Inc.